Opening the coop to find a carpet of feathers that wasn’t there the day before can be shocking, whether you’re a beginning or experienced chicken keeper. Opening the coop to find a carpet of feathers that wasn’t there the day before can be shocking, whether you’re a beginning or experienced chicken keeper. If your chickens are different breeds, you’ll match the fallen feathers to the corresponding hen before you even see her. (She’s the one that looks like she’s been caged with a raccoon.) My Partridge Plymouth Rock is recovering from her September molt. This year, her wing feathers fell out first, littering the entire coop suddenly overnight. I admit, I panicked and checked her over immediately for signs of doom. My flock starts molting mid-summer and finishes in November. It’s not that they molt for months on end, but that each hen is on her own schedule. Because they’re the same age, I attribute the difference to their individual breeds. My Polish hen is the first to molt in the summer—early enough that wild birds swoop in to gather the feathers she’s lost to make their nests. Sometimes the feathers are too big for the sparrows, which can be seen dragging and dropping feathers until they eventually give up. My Silver-Laced Wyandotte, the flock’s largest hen, is the last to molt in November. Every year, I worry about keeping her warm as overnight temperatures dip near freezing. If nothing else, molting chickens look pathetic. As their keepers, we offer empathy in human words (“You poor thing!”) and through the understanding that our nest boxes will boast fewer offerings. As your chickens go into molt, you’ll notice their egg laying slows down or stops altogether.This is because instead of converting protein into the egg whites you cook into delicious, nutritious breakfasts, your hens use dietary protein to make new feathers instead. It’s these fresh feathers that will keep them warm through winter. Feathers are made of keratin, as are beaks, talons, and even human hair and fingernails. Keratin is a very strong, lightweight and fibrous protein. In humans, protein deficiencies cause hair loss and soft, brittle nails, so it’s easy to understand why dietary protein is so important for a chicken during a molt. The health of new feathers depends on today’s diet, and those feathers have to last until next year’s molt. 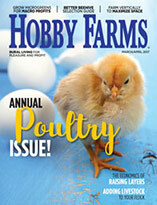 There are many ways that you can help supplement a hen’s diet and increase their protein intake to ensure healthy feather re-growth. While commercial chicken feed is formulated for optimal nutrition, free-ranging can help chickens get the extra protein needed during molts. The creepy crawlies and flying things living in your lawn are all animal protein. There is no such thing as a vegetarian diet for a free-ranging chicken! As you clean out the garden and turn the soil, employ your less-feathered friends for help. They’ll gobble up all the bugs and plants you unearth. If you’re feeding young pullets chick feed, like I am, give some to your molting hens. Chick feed has higher protein content than layer feed. While it shouldn’t completely substitute layer feed, it’s OK for your hens to eat it for the relatively short amount of time you’re waiting for your pullets to begin laying. Offer the flock its regular feed, using chick feed for a special meal or treat. Your flock supplies you and your family with food, so consider sharing the wealth. Whip up some warm scrambled eggs and feed them back to the hens on chilly fall mornings. They love eggs! Freeze-dried mealworms are packed with protein, they last longer than living mealworms, and the best part is, they don’t squirm. If you order them in bulk, you can save some cash. 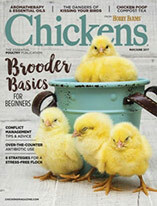 Feed them to your chickens as treats, sprinkle on a scrambled egg ration, or scatter them for free-ranging fun. 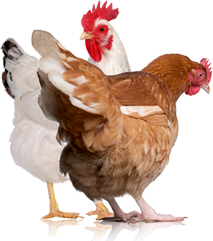 If you aren’t able to supplement your flock’s diet with extra protein, at least temporarily, stop supplementing with high-carb kitchen scraps, like breads and cereals, and eliminate the use of chicken scratch. Chickens are volume eaters; if they are filled with scratch and other empty carbs, they won’t eat enough protein from feed rations or other sources.